J. Coplans, Ellsworth Kelly, New York, 1971, pl. 196. New York, Sidney Janis Gallery, Paintings and Sculpture by Ellsworth Kelly, October-November 1968, no. 4. Toronto, Art Gallery of Ontario, Selections from the Roger and Myra Davidson Collection, January-March 1987, p. 33 (illustrated in color and on the cover). Santa Fe, Laura Carpenter Gallery, Ellsworth Kelly: Painting and Sculpture, June-July 1992. New York, Solomon R. Guggenheim Museum; Los Angeles, Museum of Contemporary Art; London, Tate Gallery, and Munich, Haus der Kunst, Ellsworth Kelly--A Retrospective, October 1996-January 1998, pl. 53 (illustrated in color). Ellsworth Kelly is a master of the expressive uses of monochromatic, unmodulated planes of color. For over fifty years, he has explored its possibilities, ranging from his dynamic early duo-tone compositions of curvilinear shapes to variegated color grids and in the present work, shaped and joined monochrome canvases. 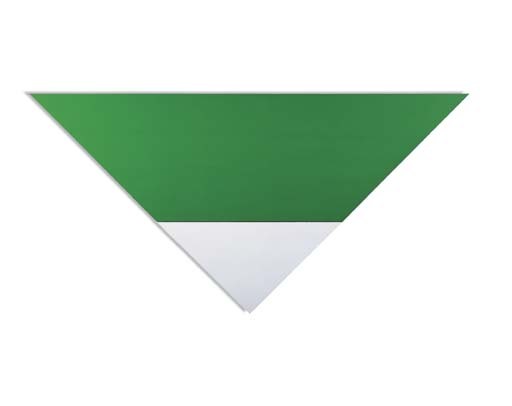 Green White is the first Ellsworth Kelly work to utilize the triangle, a form that he continues to use to the present day. Green White consists of two shaped monochrome canvases, contiguously placed to form a large triangle. The placement of the two colors causes the forms to visually move, a dynamic element which will inform much of the artist's later paintings. Like many of his works, it is based on a random encounter--in 1968, Kelly lucked upon a woman in Central Park whose green and white scarf so moved him that he followed her until he was satisfied that he had the proportion and colors fixed in his mind. It was a color combination that Kelly had previously used to brilliant effect in the seminal painting, Jersey 1958 (collection of the Hirschhorn Museum and Sculpture Garden, Washington, D.C.). With few exceptions, Kelly has utilized what has been referred to as "hard-edged" painting, working with shapes with defined contours. Like many artists who came of age during the 1940's, Kelly was influenced by Abstract Expressionism. His work belongs to its reductive "school", with Barnett Newman, Ad Reinhardt and Mark Rothko as its forebears. Despite their superficial similarities, Kelly's concerns were dramatically different. "Kelly was not interested in the limitless expanse of the field within a single canvas, but in extending the canvas, aligning color panels as separate modular units. By eliminating any suggestion of space within the canvas, and by suppressing his brushstroke, Kelly could have color suggest mass and be both figure and ground. Instead of regarding the canvas as a field of action, as the Abstract Expressionists did, Kelly wanted his work to function as an object that relates to the wall, to the room, to architecture" (D. Waldman, Ellsworth Kelly, New York, 1997, p. 29). Of vital importance to Kelly's early development was the example of Jean and Sophie Taeuber-Arp's geometric and biomorphic works, as well as Matisse, whose work he saw during his formative years while living in Paris between 1949-1952. In particular, Matisse's glorious late "cut-outs", which are collages consisting of sharply delineated, cut-out shapes of pure color appear to have made a powerful impact. An important and influential work, Green White is marked by a hard-edged elegance and sumptuous color for which the artist is best known.